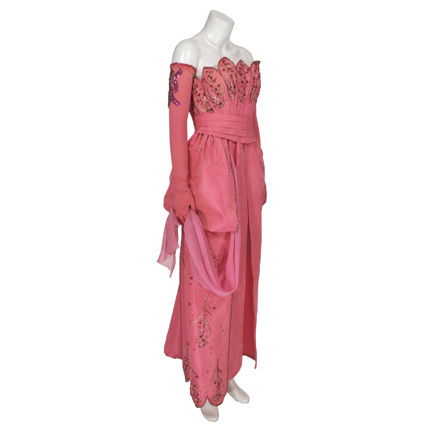 This costume was worn by the character “Shirley Feeney” portrayed by actress Cindy Williams in the classic television series “Laverne and Shirley”, which ran from 1976-1983. 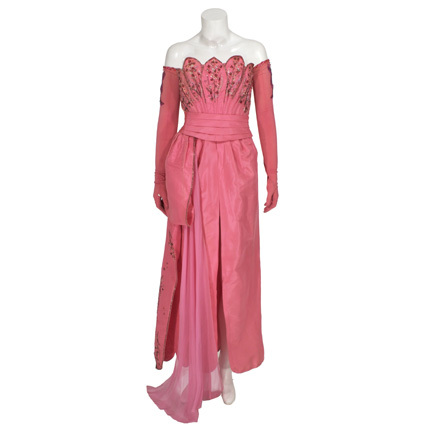 The costume was custom made for the actress and consists of a pink taffeta dress, matching cummerbund, detachable chiffon drape, and a pair of opera length gloves. 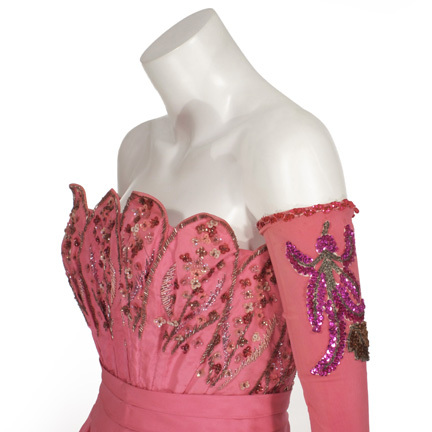 The dress has hand sewn bead and sequin details on the bodice and skirt, with matching details sewn onto the upper arms of the gloves. 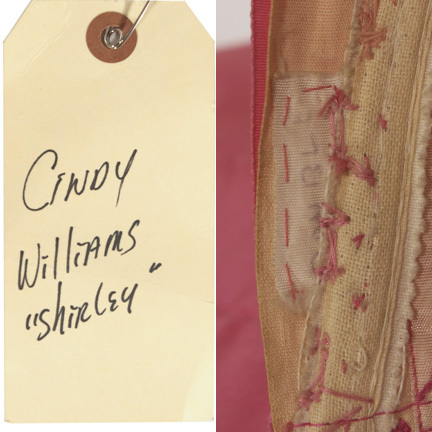 The costumer’s tag is attached with “Cindy Williams, Shirley” handwritten in black ink. 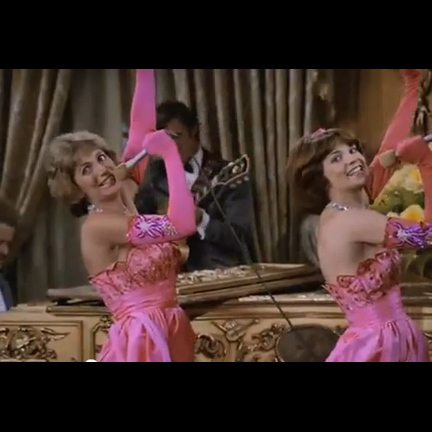 The actress wore the costume in “Citizen Crane” (Season 2, Episode 23) during the “Da Doo Ron Ron” musical number performed alongside series costar Penny Marshall (as “Laverne DeFazio”). 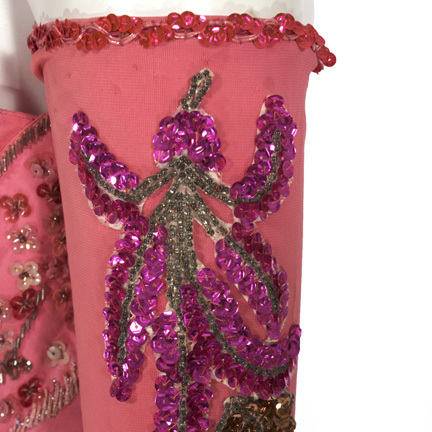 The American flags seen attached to the interior of the dress during the performance were removed for use on a subsequent production. “Citizen Crane” originally aired on April 5th, 1977. “Laverne and Shirley” was nominated for four Golden Globes over the course of its seven-year run, and Al Lehman received an Emmy Award nomination for Outstanding Costume Design For a Series in 1979. 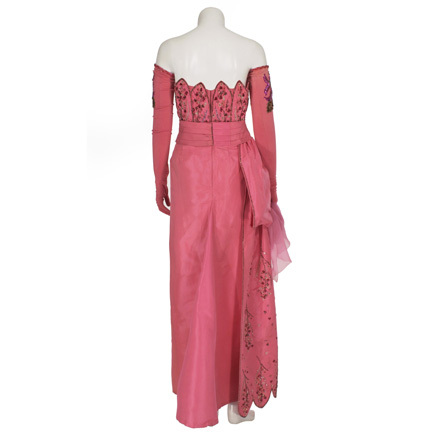 The costume is in good vintage screen worn condition and is accompanied by a letter of authenticity.